TabletWM is a window manager for the X Window System designed specifically for tablets. Its main characteristic is that it keeps all windows maximized and without decorations, allowing to work with classic linux apps in a tablet-style. 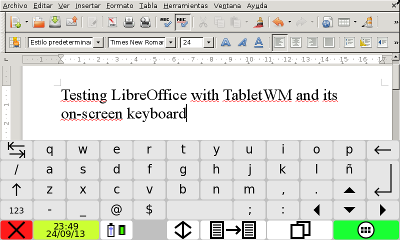 The picture above shows LibreOffice and the on-screen keyboard working with TabletWM. By default both the bar and the on-screen are hidden, until the user presses Ctrl+MENU keys. This combination shows both the bar and the on-screen keyboard. This combination is emulated by the GSL1680 touch driver when the user touches with three fingers. This allows to work with classic desktop applications without a physical keyboard and mouse. By pressing MENU key, or moving the mouse cursor to the bottom of the screen, only the bar will be shown. This allows to work better when using an external keyboard and mouse. This page was last modified on 10 November 2013, at 22:31.